First, there's something wonderful to my eye about a large-tired rigid fork mountain bike from the early 90's. In the days before suspension became prevalent, the design teams focused on getting the best out of the a simple system. 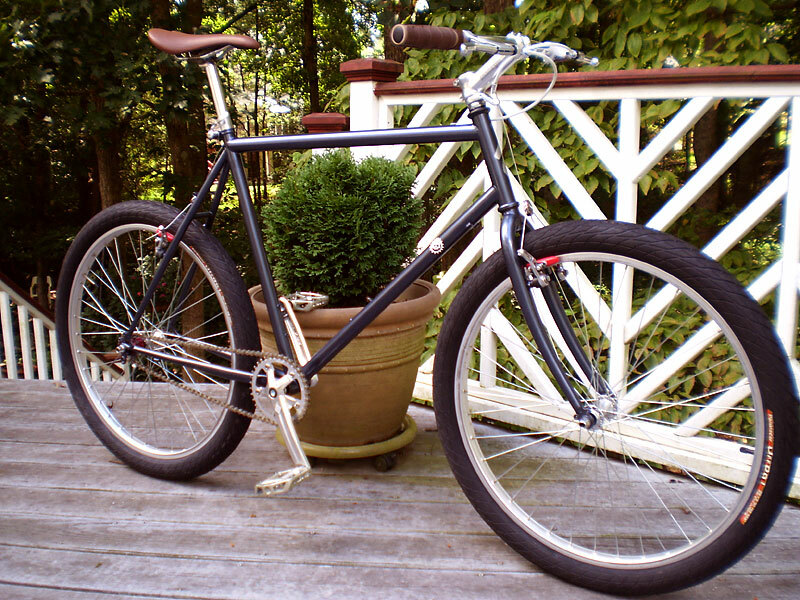 The frame tubes were not overwhelmingly huge or formed and the lines remain clean and strong. The Hardrock wasn't as fancy as it's sibling the Stumpjumper, but a lot of the differences at this point had to do with stem size/angle offerings and componentry - the Hardrock was a tremendous value. Second, it's one of the types of bicycles which I actually lament not having nabbed when I worked in the industry (actually, my specifically egregious failure to snap up an amazing value was not getting one of the last steel Stumpjumpers - we had bought the last of the runs of these maroon, rigid-forked models which IIRC was destined for the European market. But, I digress). When the quality steel mtb's started to dwindle, most of us just didn't notice - overcome by lust for titanium, exotic aluminums and the just-appearring carbon fiber. Third, Bill managed to get his neighbor's rescue dog into the final photo. Now, I ask you, how can you not feature an entry which does that?